A brilliant long gin cocktail that definitely doesn’t get the love that it deserves, it’s a great alternative to a G&T. Simple to make, it’s also a great cocktail to scale up into a punch which you can batch up before time for parties and picnics. Created for the after-show party for the West End musical Floradora when it transferred to Broadway, where it became one of the first successful Broadway musicals of the 20th Century. 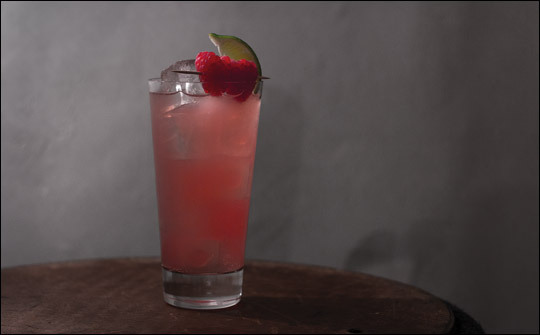 You’ll notice that the recipe below calls for either raspberry syrup, or raspberry liqueur. The classic uses raspberry syrup, however it’s much easier to get your hands on raspberry liqueur, and in practice you can use any berry liqueur that may be lurking at the back of your booze cupboard: cassis, Chambord, framboise, fraise, etc. Fast becoming my favourite summer cocktail. Such a great combination of flavours. Love the raspberry and ginger combo.